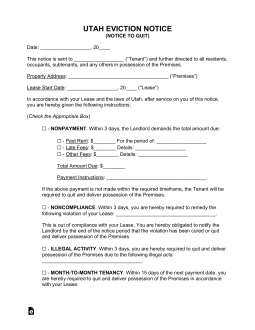 The Utah eviction notice forms may be used as a first step in the eviction (also known as unlawful detainer) process. Tenant must receive notice before a landlord goes to court to seek eviction of a tenant. If, after the time period of the notice has expired, the tenant has failed to respond appropriately, then landlord may seek redress in the District Court that has jurisdiction in the area the rented property is located by filing the Complaint and Summons. Both forms may be filled-in by using the State’s Self-Help Document Producer. These will have to be properly served on the tenant. The landlord must file a Return of Service with the District Court to inform them that the tenant received the notice. The tenant will only have three days to respond after notice. If tenant does not respond, then landlord can seek an Order of Restitution to claim possession of the property. Eviction Summary – Use this Flow-Chart to see exactly how the eviction process works in the State of Utah. 3-Day Notice to Quit (Non-Payment) – This lets tenant know that they are behind in their rent and that they must pay or leave within three days. 3-Day Notice to Quit (Non-Compliance) – This form lets tenant know that they are in breach of the lease, other than for non-payment and that they must cure the breach or leave within three days. 3-Day Notice to Quit (Illegal Activity) – This is similar to the above in that tenant has to leave in three days due to illegal activity on the premises. 15-Day Notice to Quit (Month to Month Tenancy) – This form is for use when there is a month to month tenancy in place and one party does not intend to renew. This lets the other party know of the intention no to renew. In Utah, rent is due on the date specified in the lease. If tenant fails to pay, then landlord may seek eviction, first by notify tenant of the potential eviction and giving him three days to pay what is owed. Step 2 – If tenant fails to cure the breach and/or fails to vacate the premises, then landlord may proceed to the Local District Court to file a Summons and Complaint for eviction. In Utah, the court system has a Self-Help Document Producing Site that you can use to create the documents you need. Step 3 – After you have prepared and filed the Complaint and Summons, you will have to make sure the tenant is properly served. You cannot serve the tenant yourself. You will have to have a sheriff or someone else complete serve and you will have to have evidence of the service to file with the court, called a “return of service”. Step 4 – The tenant will have the right to defend themselves and reply to the court (usually within 3 days of being served) by using the Answer Form. This may also be filled-in using the Self-Help Website provided by the State. Step 5 – If landlord prevails in court, the court will issue an Order of Restitution giving the Plaintiff three days to move out before the sheriff will be authorized to remove the tenant. The Signed Lease being discussed by this Notice will contain some valuable information which must be transcribed onto this Notice. Thus, generally, having it available for review before filling out information would be considered wise. The form you require are easily accessible on this page by clicking on the button labeled “PDF,” “ODT,” or “Word.” Each of these will contain the Utah Notice To Quit in its respectively designated file type. The party this document is intended for must be reported on the blank line at the top of this page just beneath the Title. The Full Name of each of these parties must be reported here. This form will be introduced by a few statements. The first one needing attention will have the phrase “…in the City of” followed by a blank space. Report the City where the Rented Property is located here. Then use the next two spaces to report the County then the Zip Code where the Leased Property is located. The Building Number and the Street of the Rented Property should be recorded on the space following the term “designated by the number and street…” Obtain the information you enter here from the Lease. The next statement requiring information will call for the Calendar Day, Month, and Year the Rental Agreement lists as its Signature Date. These items should be recorded on the spaces following the term “…lease agreement signed on the,” in the second statement. The main area of this form is used to provide you a choice of Notices. There are four available Notices which may be issued by the Landlord and one that may be issued by a Tenant. Check the box next to the Notification Statement containing the wording and terms you need to issue to the Recipient (when served). The first box may be checked by an issuing Landlord or agent. The “Nonpayment” terms will notify the Addressee, listed above, that an Overdue Rent Amount must be collected within Three Days of Notice Receipt or the Landlord will expect to be given possession of the Property. The second box may be checked by an issuing Landlord or Agent. The “Noncompliance” terms will inform the Recipient listed above that a breach of contract has been committed and he or she has Three Days to rectify the situation or return possession of the Property to the Landlord. The third box may be checked by an issuing Landlord or Agent. The “Illegal Activity” terms simply states the Tenant must evacuate the Property and move out within Three Days of this Notice. The Illegal Activity that caused this Notice to be issued must be reported on the blank line. The fourth box may be checked by an issuing Landlord or Agent. These “Month To Month Tenancy” terms from the Landlord requires the above Recipient to vacate the Leased Property since the Landlord is ending the Lease. The Date the Month To Month Tenancy ends must be reported in this statement. Also, it must provide Thirty Days’ Notice. The fifth box may be checked by a Tenant issuing this Notice to his or her Landlord. These “Month To Month Tenancy” terms are meant to provide Thirty Days’ Notice to the Tenant Termination of a Month To Month Tenancy Agreement. If this Notice is to be successfully delivered or served to the Recipient listed, then it must bear the Signature of the party who has made sure this paperwork reached its destination. The blank spaces in the “Certificate of Delivery” statement require the Deliverer to record the Date of Delivery and the Full Name of the person this paperwork was delivered to. Below this, the Delivery Agent will need to define the Delivery further by checking one of the statements next to one of the check boxes. These statements will describe the Delivery as one made in person to the Addressee, one made by leaving it with a second party who will bring it to the Addressee, or using First Class Mail Service to mail it, via USPS, to the Addressee. The Certificate of Delivery must be Signed by the Agent of Delivery on the Signature Line provided.